I love that Judaism is a religion of doing. Whether it is praying, donating, eating, meditating, learning, or talking, Judaism is a religion of action. 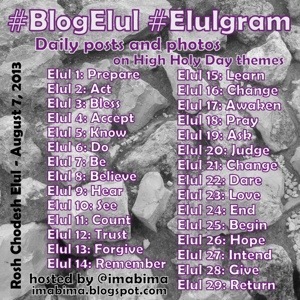 Right now, in this month of Elul writing this blog is part of my spiritual preparation. What did I do right this year? Where are my growing edges? To whom do I need to apologize? Teshuvah, repentance, is hard work. It’s time to get to it!